Audi's long had a fetish for cramming its headlights with an almost puzzling level of tech. So much so that it might lead one to wonder, why all the fuss? Are headlights really that important? Well, yes actually. And they're about to become even more so, with Audi taking them places you and I are unlikely to have ever imagined. Most people think of headlights as an essential but boring component of any car. An area in which the potential for envelope pushing is fairly limited – they're lights, they light things, end of story. 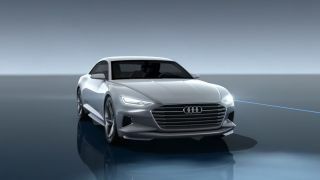 But Audi has an obsessive urge to expand what headlights are capable of, and ultimately what they're going to be used for. The new Audi A4, which is already on roads in most of Europe, landing in Australia in February, and hitting other markets soon, is just the latest example of Audi's headlight ambitions. The car's optional Matrix LED headlights – first seen in the A8 – put on a light show that's as clever as anything you're likely to see on New Year's Eve. The idea behind the technology is to enable drivers to enjoy the visibility that comes with using high beam at all times, without worrying about thoughtlessly blinding everyone else on the road. "Fundamentally, you want high beam the whole time," says Steve Pizzati, the head of Audi Australia's driver training team. "You want as much illumination as you possibly can. The only reason you dip it is because it annoys other people." Audi achieves this by using a camera in the front of the car to detect the lights – both front and rear – of other vehicles, whether they're in your lane, a lane beside you, or passing in the opposite direction. It then tracks each vehicle's trajectory and can monitor up to eight vehicles at once. This data is transferred to the headlights, which use 50 individually-manipulated horizontal segments to dim the light only in parts of the road occupied by other vehicles, leaving the rest of your surroundings brightly illuminated for maximum visibility. "The person in the other car is hardly even bothered." says Pizzati. "It's even better than the low beam you'll see from a regular headlight." Even though the technology debuted a couple of years ago, watching up to eight panels of darkness move like inky fingers through the A4's bright spread of LED light – leaving tracked cars untouched – is still impressive. Other vehicles aren't the only thing Audi's mindful of when utilising headlight technology to maximise safety. Pedestrians – yes, those pesky Lemmings that so enjoy stepping out onto the road without so much as a glance up from their smartphones – are protected, too. Marker lights are used to alert the driver to pedestrians that are standing too close to the road for comfort. They flash three times in succession, both illuminating the pedestrian in eye-catching fashion for the driver, and sending a terse message to said pedestrian that they'd best not take another step forward or else they'll have to endure having Audi's four-circle logo permanently branded into their forehead. The current generation's camera also recognises road signs and prevents the high beam lighting from striking them. This prevents the light from bouncing back glaringly into the eyes of the driver, which can temporarily blind them, or at the very least cause them to miss what the sign actually said.